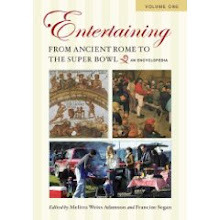 No doubt you visit Culinary Types to meet some fascinating epicureans, sample some witty prose, or feast on a banquet of food history. A visit to my kitchen is a far more frightening scenario. Something along the lines of Jacques Pepin meets Jackson Pollack. There comes a time in every chef’s life journey when he must admit that the kitchen system just isn’t working anymore and needs a complete overhaul. The pantry is in fact, imperfect. The canola oil smells funny, that pancake mix from 2001 is probably dicey, and the special-edition commemorative Heinz Green Ketchup is now far greener than when I first bought it. It doesn’t help that dear Lydia from the Perfect Pantry is currently highlighting “Other People’s Pantries” each weekend. The immaculate photos from my fellow food bloggers make me feel like a pariah. I have to admit it. My kitchen cabinets are chaotic and I’m a slob. I need help. 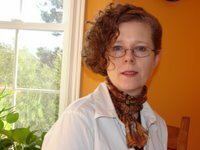 Enter Rosemary Flannery, expert declutterer and owner of the service “No More Domestic Drama.” She promises to devise a strategy for downsizing and managing the mess behind the curtain – “Find what you need, when you need it!” She’s one part Felix Unger, one part Sigmund Freud. I am clearly uncomfortable when I meet Rosemary at the train station. It’s not easy to reveal your dirty little kitchen secrets. Will she think less of me for co-mingling Pfaltzgraf dishes with plates from IKEA and Flintstone Jelly Glasses? Fortunately, she is non-judgmental and we get to work immediately in systematic fashion to set things right. 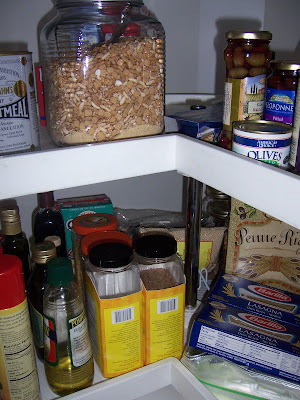 Every parcel of food is removed from the cabinets, the expiration date is checked, and items are grouped into similar categories – Pasta, legumes, grains, sugars, flours, spices. I feel a cold sweat coming on as I am forced to choose between mini-muffin pans and an over-supply of spring form pans. Rosemary is brutally efficient, but supportive. “Will you ever use it again?” she asks pointedly. “How are you feeling?” she’ll also enquire periodically. We start a “Toss” pile, a “Donate” pile, and a “Maybe” pile. Dropping the rusted tart pan on the “Toss” pile is a no-brainer, but I’m really torn over the salad spinner. It goes to the “Maybe” pile, although after Rosemary leaves, I regress and put it back in one of the cabinets. Ah well. Therapy is a process, not an immediate transformation. As the afternoon wears on into evening, the donate pile gets larger, and the cabinets start to look roomier as well. 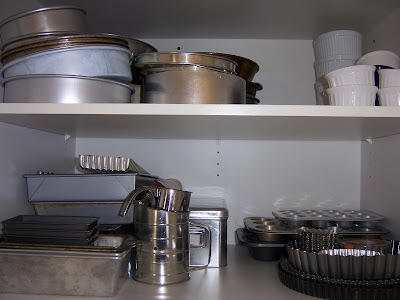 All baking items are consolidated and grouped together into one large cabinet (although later I discover some additional cake pans hidden away in the guest room). I can actually see every item. Mini-casseroles and baking dishes are stored together over the stove. Rosemary is creating a strategy of storing items where you use them. Already I can see that my trips back and forth across the kitchen will be reduced. We sort through many stacks of dishes, and the treasured mustard-colored stoneware from Bennington, Vermont and my Liberty Blue Ironstone with scenes from the American Revolution is brought up from the basement and given a home in one of the large cabinets. Rosemary maintains that you should use your nice things and enjoy them, instead of packing them away. We make a trip to a home furnishings store and purchase additional shelving and quilted China storage sets for larger seasonal collections of dishes. These will be stored, but easily accessible for more elaborate celebrations. “Couldn’t we round that up to half, just so I feel a little better?” I beg her. There is still work to be done, but I am on the road to recovery. I make a conscious choice not to purchase the snazzy Rachel Ray mixing bowls in Bed, Bath and Beyond because they will clutter my cabinets, and my multi-vitamins are in easy reach when I pour my orange juice in the morning. I’m looking forward to my next cooking project. I am still thinking of fishing that mini-muffin pan out of the donate box, but I have time to work on my willpower. In the meantime, the pantry, while hardly perfect, feels far less dramatic, exceedingly more functional and a bit more serene, at that. My dear friend, I applaud you! 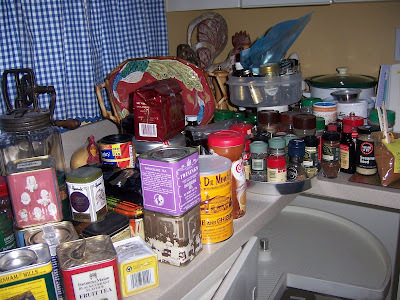 Not, of course, because I believe that all pantries should be perfect (mine most definitely is not), but because it's so satisfying to pull everything out, remove what you no longer use -- and make room for new acquisitions! I donate my things I'll no longer use to a halfway house for women transitioning from prison to their own apartments. 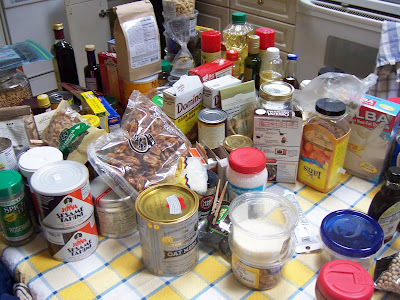 I know my extra cake pans, pots and mixing bowls will have a new life, and I can breathe a bit easier in my own pantry. And the food that's past its expiration date? We all have some. And if I weren't writing about (and photographing) my pantry items every week, I'm sure some items would be old enough to officially be called fossils! Great post T.W., as always! I enjoyed your sense of humor and empathized about the mini-muffin pan. Your description in terms of "Jacques Pepin meets Jackson Pollack" is priceless! :-). Thanks! Wow... Your pantry is so packed with good stuffs & kitchen equipment. I don't dare rummage through mine, it's mostly packed with kitchen robots rather than ingredients! I really like the quilted containers for dishes. Your pantry looks really excellent! Starting to look good. It's hard to give away stuff but it feels good to know that someone in need will be getting it for free. wow this is awesome! But I agree with, please fish out that mini muffin pan. I have not used mine in years but I'm sure it is an important part of the kitchen. I dunno how many times I've reorganized the kitchens. right now I had all the occasional dishes moved to the basement and I have filled up the newly installed shelves over there too! 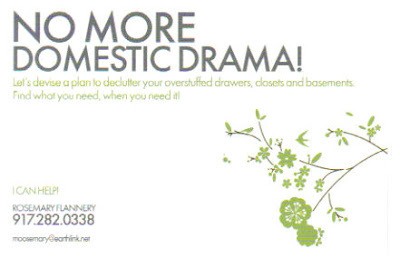 I don't dare reorganize mine or even attempt it, and I'm certainly not brave enough to allow a professional organizer into my kitchen! That was quite courageous of you! While cleaning out the pantry is a needed task, it is also a trip down memory lane. When my mother passed away and we cleaned out the house all of those 15 year old spices and containers brought a lot of memories back. That being said we finally cleaned ours out a bit to make room for the babies bottles and the 4 year olds ever growing collection of Dora dish ware. Lydia - I'm going to print out your comments and show them to my father. Maybe he'll finally understand! 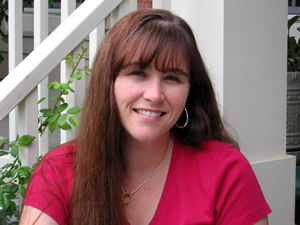 Manuela - Many thanks! I still haven't parted with the mini muffin pan! Valentina - it took courage, believe me! Maryann - I think everyone has a system that works for them! Lidian - Those quilted containers are an epiphany! Helene - I still have some work to do, but it's coming along. Louise - You'd be really proud if I'd have had the nerve to post "before" pictures! Veron - I have had more shelves installed than I can count, and they are still overflowing! 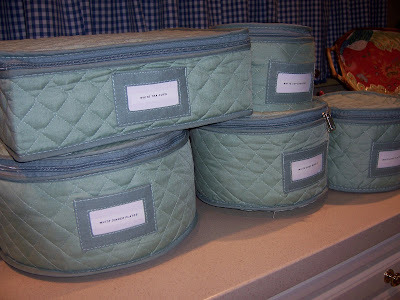 Colette - actually I think the quilted storage containers are "sea foam green!" Andrea - I think you've made it unanimous - the mini muffin tin stays! Kathy - I'm not sure the world is ready for the truth about my storage containers! McCormicks, as a public service (!) will tell you which old spices to toss (on their website), but I stubbornly hold on. Mostly I reuse the containers; anything too old is never used anyway (but I want the security blanket -- it's there). And so it goes with our pantries. We want everything on hand for the inspired dish. You were very brave! and send those photos to Lydia -- I'm looking for them. And yes, salad spinner -- we don't make a green salad without it, and even things like a bunch of cilantro loves it. Susan G - All I needed was one more reason to keep the salad spinner, and now I have it! Great idea on the cilantro! I've read about these de-clutterers, but have never seen one before. Pretty cool, huh? That's the American entrepreneurial spirit, alive and well. By the way, I noticed you had TWO cans of sesame tahini paste, and since I don't want you to clutter your pantry any more, I could take one off of your hands for you.